Nearly everyone has experienced both low and high humidity. Perhaps you already know, to some degree, what a humidifier’s job is. But did you know they can relieve some common sinus, cold, and other problems? 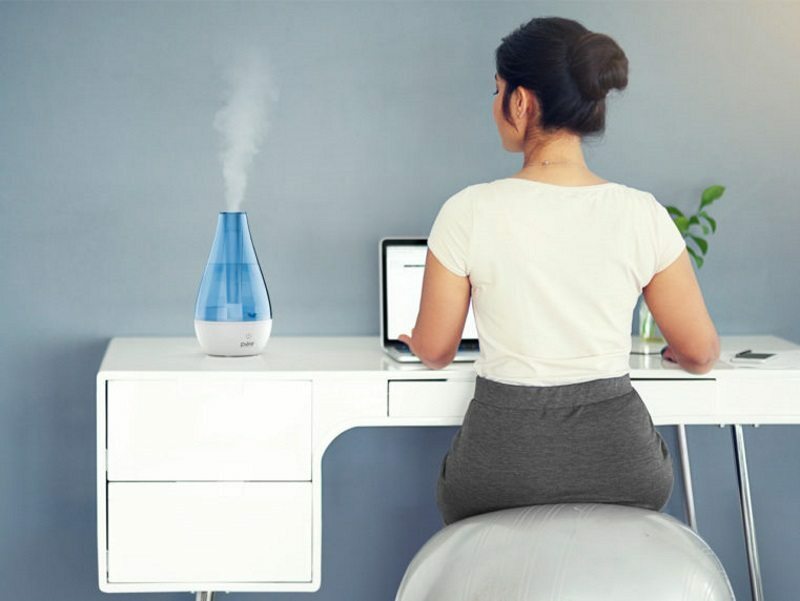 If you’ve been asking yourself, “What does a humidifier do?” this post will help answer that. Recently during the winter I became sick with a sinus cold. The dry air (due to electric heaters in my home) actually made me suffer much more than I would have otherwise. I bought a wonderful little humidifier and felt better immediately. It’s one of the best purchases I’ve ever made! Buying one was a great decision – so much so that I was inspired to write this and share with you what I’ve learned. I’ll tell you everything you need to know. 4. What humidity should I set my humidifier to? 5. 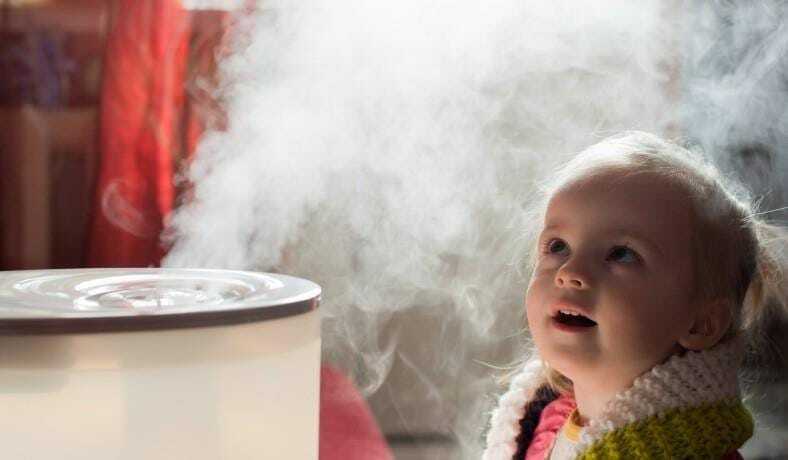 How does a humidifier cost? 6. Does a humidifier help with a cold? Humidifiers work by taking water and converting it into a fine steam or mist that increase the amount of moisture in the air around you. It’s similar to how running a hot shower in your house steams up the air. The water tank stores water to allow it to run for several hours – especially overnight use. 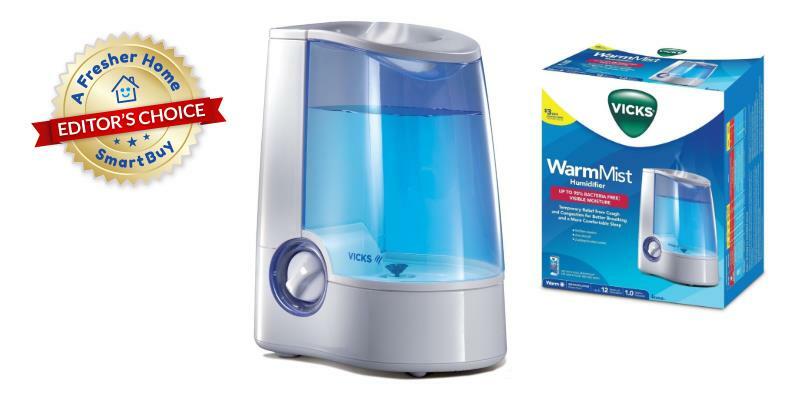 Shown here is a Vicks warm mist humidifier with a large water tank. Humidifiers are devices that increase the humidity in a room. They work by changing liquid water into a mist or steam which increases the humidity in the air. Humidity is a word used to describe the amount of moisture, as a percentage, in the air around you. However, it’s not just adding moisture into a room’s air that makes them so helpful. It’s the additional benefits you might not yet be aware of that can improve your quality of life. There are a number of different kinds of humidifiers which I’ll cover in more detail below. Don’t stress though – for the average person, the most important thing to worry about is getting one within your budget and needs. Honestly, you don’t have to worry too much about particular details unless you have special requirements. In the scale above you can see a general guide for the relative humidity. This is a way of expressing how much water vapor there is in the air compared to the dry air for a certain volume & temperature. For most people, we feel most comfortable if the relative humidity falls within a certain range. Too low, and we feel cooler, our skin gets dry, and we are prone to various problems & sickness. Too high, and we can’t cool of as well and we’ll feel uncomfortable and much hotter. The humidity around us can have a huge impact on our comfort and health. Believe me, as I traveled in the past to various countries like Panama and Colombia, the high humidity was really tough at times and it was so hot I was constantly sweating everywhere I went! Cities near the ocean like those are typically very high in humidity. On the other hand, some areas like in Arizona (where humidity is low and the air is dry) and in seasons like winter the moisture is reduced greatly. This means the humidity falls quite a bit, as colder air cannot hold as much moisture as warm air can. Dryer air means dry sinuses, skin that gets dried out and cracks, and being more likely to get sick. It can also cause waking up the next morning with stuffiness, congestion, and an uncomfortable feeling in your nasal and respiratory passages. Not only that, but dry air makes it more difficult to recover from colds and other common sicknesses we have to deal with. In my personal experience, 40%-60% is the ideal comfort range but what works for me could be different for you. 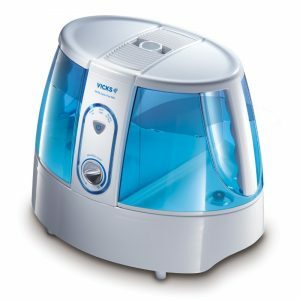 Warm mist humidifiers like this Vicks V90 model can increase the moisture – and hence the humidity – in your home by using heat to vaporize water. The water tank is filled when it runs out and can allow a number of hours of uninterrupted use. I own one similar to this, and it greatly helped me when I was sick! These types produce moisture as steam by heating the water with a hot heating element which heats water to a boiling point. Moisture released into the air is warm but generally safe enough to put your face right up to the output opening. These types, in some cases, can be used with additives like scent pads or optional soothing vapor liquids if you need cold and nasal or breathing problem relief. Some models include a filter to trap minerals and other elements that may build up from the water used to produce the steam. They, like some others, must be cleaned periodically in order to reduce bacteria that builds up and prevent transmitting the bacteria into the air when steam is released. These types produce moisture in the air without warming the water and without using heat to produce steam. Ultrasonic models such as MostAire Studio Ultrasonic model are a more modern approach. They use an extremely high-speed nebulizer to rapidly oscillate, causing water to be dispensed as a fine mist into the air. They’re a good choice if heated water is not desired and may use less electricity as well. They often appear somewhat similar in appearance to their warm mist counterparts, but don’t require nearly as much power consumption since they’re more energy efficient. An impeller type humidifier, unlike others, contains a motor and “fan” assembly to stir up water and produce a fine mist. This is an older technology and is less commonly found today, but can still provide a simple and easy to use way to keep a room at a comfortable moisture level. This Vicks V400R model is a great example. Products classified as impeller models are those like I had as a child. They work by using a rapidly spinning disk with “fingers” sort of like fan blades to disturb water and allow tiny droplets to escape as a water mist. These product a bit more noise when operating and aren’t quite as common as they once were due to the newer ultrasonic and warm mist models available today. An example of a simple evaporative humidifier. This model is perfectly silent and slowly releases moisture into the air. If you need improved humidity quickly, you’ll need one of the other types instead. These lower-cost Bluestone decorative humidifiers are a good example of an old-fashioned but stylish way to humidify your home with zero noise added. Note that there are motorized models which use a fan as well. Evaporative products are those that normally generate moisture into the air directly. That is, they work either by simply providing a way for moisture to gradually evaporate and enter the air or by blowing a fan over a wet wick to speed up the process. These are the simplest and often the most inexpensive models, but also are the slowest to affect the humidity in your room. What humidity should I set my humidifier to? Typical humidifiers don’t have a “humidity level” (although some models with more advanced features do). So you’ll need to adjust the level manual. For example, you may need to turn it to the “high” or “low” setting depending on how the one you buy works. For most of us a range of about 30-50% humidity is ideal. As a general rule, approximately 50% is a safe bet. Too low and you’ll begin feeling the effects of dry air. Too high (say 60% and higher) and you’ll feel hot, may have trouble sleeping, and generally may be very uncomfortable. The main issue that a humidifier can help resolve is the effects of low humidity caused by indoor heating. I’ve frequently noticed how low in moisture my indoor air became during the winter time and especially when the heat was in use. The includes electric heat, natural gas-based heating, and especially wood fireplaces and heaters. Note: Don’t worry! You’ll never see 99% humidity…this is likely a display test being shown. You’ll likely never see above 60% or 65% except for when there’s a huge amount of moisture in the air. This happens after running a hot shower a long time or other similar sources of steam. The one pictured here works well, doesn’t cost much, and is easy to use. 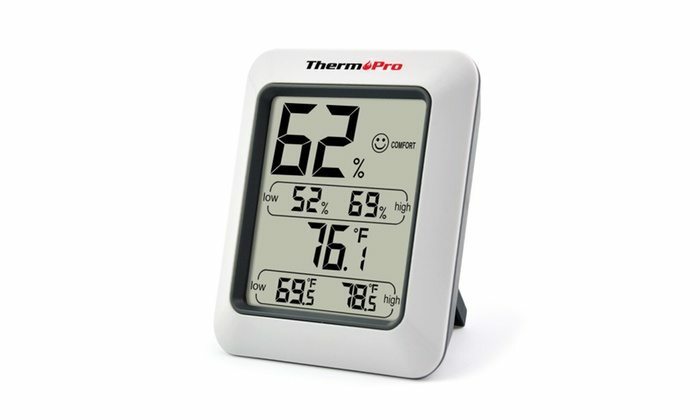 A great idea is to use an inexpensive digital temperature and humidity gauge with your humidifier. Having a gauge will allow you to see how low the humidity is where you’re at. It’s a good way to determine the setting you’ll need on your humidifier. For example, I keep one of these both in my bedroom and my work office. Both before bed and during the day I’m able to tell what mode I need to put my humidifier in. 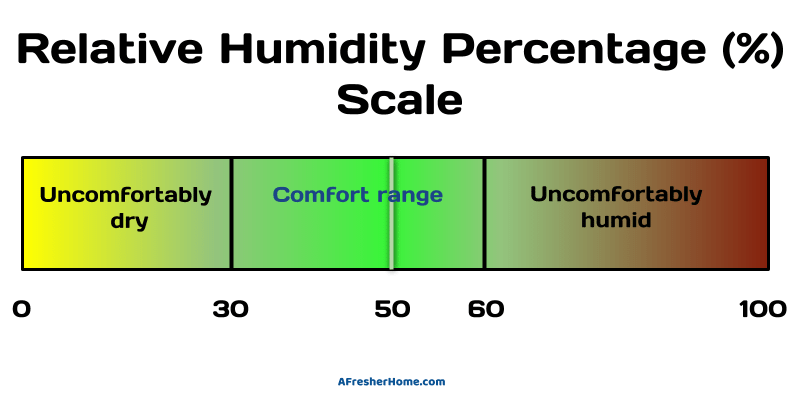 For example, if the humidity is extremely low and I know I’ll be using the heat nearly all day or night, I normally need to leave it on high to keep the room near 50% humidity. If I’m using the heater less often, the humidity inside when I arrive home (especially on days where it’s not quite so cold) is higher, so I’ll use it on the low position. If you buy a humidifier with an actual automatic humidity control, that’s fantastic! Set it between 40-50% and experiment with what works best for you. How does a humidifier cost? 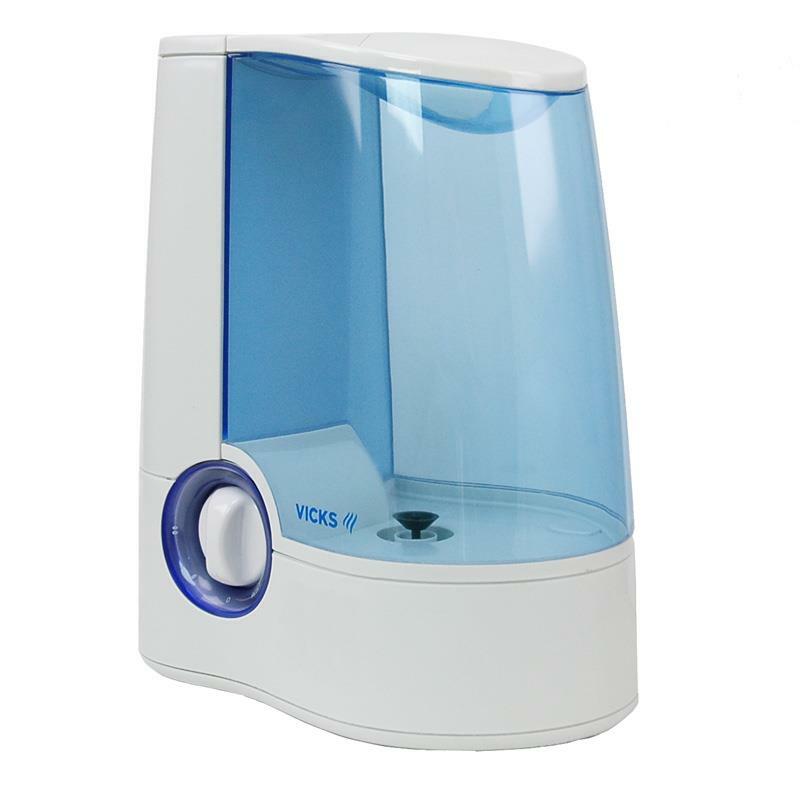 Humidifiers that for small to medium-sized rooms cost about $30 to $150 or so. What you pay greatly depends upon the features and capacity. I recommend if you plan on using one overnight or for long hours, buy one with additional water tank capacity. Models starting around $35 and up like this warm mist model by Vicks can hold 1 gallon of water and the use time can range from about 8 or 9 hours to over 12. The time depends upon the setting you use (and how much mist is produced, accordingly). Ideally you can plan to at least buy one for each bedroom that’s occupied and perhaps one for your living room, if needed. Expect to spend around $35 or so for a competent humidifier that’s a good combination of quality, value, and features. Additionally, don’t “cheap out” on spending or you’ll get a small water tank that requires refills more often. That’s a hassle! 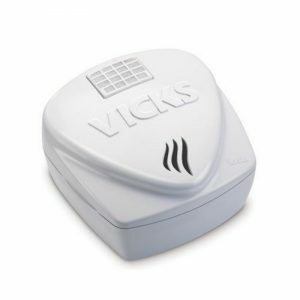 Shown here is a great model I enjoy and recommend, the popular Vicks V745A I own and love from Amazon. Personally I enjoy using one at work as well, as it keeps my office comfortable, reduces my coughing, and helps me avoid complications and sickness. As a starting point, I recommend you plan on spending about $35 for each room you want an electric-powered humidifier in. Buy one with a sufficiently large container (say 1 gallon/3.8 L) so you won’t have to constantly refill it. You can spend less, but unless you have relatively small needs, a larger one that produces moisture more quickly provides better relief more quickly. Does a humidifier help with a cold? Indeed, it can! Humidifier use is a great way to reduce your cold symptoms. It can definitely help aid in recovery when you’re sick. I’ve experienced this personally. In my case the dry air on several occasions caused me to wake up from my sleep. The uncomfortable sinus dryness also made me more susceptible to getting a cold or sinus condition. We normally need a healthy humidity level to keep our internal breathing passages clean. The drying out of our nasal and respiratory passages means we’re more susceptible to becoming sick. A healthy amount of moisture in the air leads to reducing your cold suffering and allows you to heal properly. A study by Environmental Health and Engineering (Environmental Health 2010, 9:55) shows that keeping air at relative humidity levels between 40-60% can reduce survival of flu viruses on surfaces and in the air. Humidifiers can help achieve and maintain this humidity level. Low humidity increases the time it takes for your body to rid itself of mucus produced when you’re sick. Also, your throat, sinuses, and bronchial passages will feel quite uncomfortable at times. Otherwise you’ll have to use nasal sprays or similar remedies as a work-around. But why not address the problem at its source? 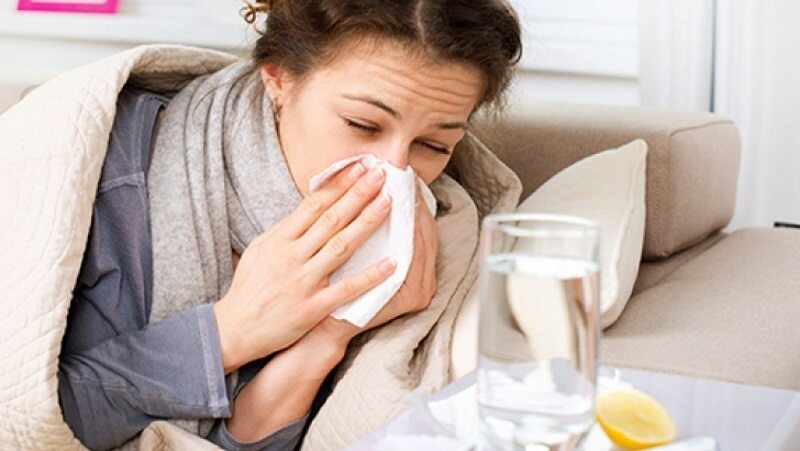 It is definitely no fun being unable to sleep because of painful coughing and sinus or throat pain from it. That’s a terrible feeling I wouldn’t wish on anyone! Buying a warm mist humidifier was one of the best decisions I’ve ever made. I immediately felt relief at night while the heat was on. Despite the outdoor temperature being near freezing (32 degrees), inside I was comfortable and cozy. The added moisture helped reduce my coughing. Despite being sick, I woke up with far better feeling sinuses and I no longer had to breathe dry air that hurt my nose and throat. I also had far less mucus bothering me. Also, I no longer had to go run a hot shower in order to get relief – my bedroom was near 50% humidity nearly all the time! Cleaning a humidifier is a required task for owners. Over time, minerals and other elements build up and form deposits. Bacteria can also begin to grow which can be spread into the air if left unsanitized. Vinegar and a soft scrub brush is recommended for washing both the water tank and the body. Different types of water like well or spring water will cause a humidifier to build up mineral deposits. Even standard tap water (“city” or faucet water) can cause the same. Bacterial growths can occur, too. You’ll need to periodically inspect and clean both the water tank and the body too. Using a very small amount of vinegar is recommended. Additionally, cleaning agents that are safe for plastic or a very small amount of bleach can be used. Using one of the recommended cleaners, rinse both the water tank and the humidifier where build-up occurs. Use a non-abrasive soft brush to clean the areas where mineral deposits are found and wash surfaces thoroughly. 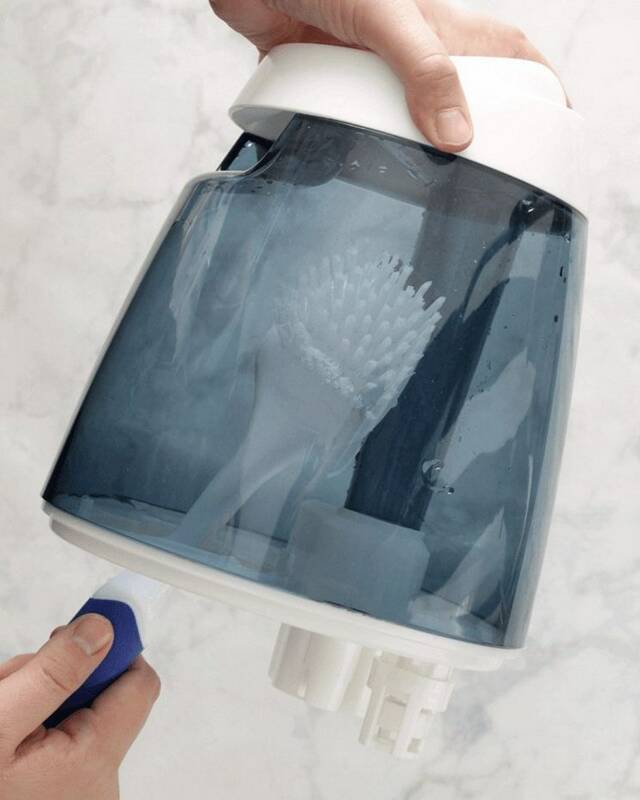 A soft bristle toothbrush makes a great cleaning tool for purifiers. For best results, clean your humidifier weekly. Sources of water with high mineral levels are not recommended due to the increased build-up they promote. I recommend standard faucet water or distilled water if that’s convenient for you. Remember, if bacterial build-up occurs in your humidifier due to a lack of cleaning it could enter your air! Don’t allow that to happen. Follow the manufacturer’s cleaning recommendations. Additionally, don’t forget to always check buyer reviews. For those looking for a basic but good budget model, here's a great one to consider. It’s a best-selling model I’ve actually owned and recommend! If you have allergies or other air quality problems consider getting an air purifier to do along with your humidifier. Both can be used at the same time without any problems. You can read more here to help you understand which air purifier you need. 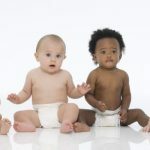 If you have a baby, here’s a helpful post regarding choosing an air purifier vs humidifier for your baby in case you’re not quite sure what’s best for your little one. This article was very informative. Actually, I liked it so much I mentioned you in the infographic of my article (https://mysleepyshop.com/sleep-better-night/). I discovered the use of humidifiers I was struggling with insomnia. Using humidifiers has helped me to get some sleep at night. I mostly use the humidifiers to diffuse essential oils. When I am diffusing essential oils, I use cool humidifiers because they do not affect the stability of the oils. I also dilute the essential oils to make them a little bit mild for inhaling. Some of my best oils for bedtime include vanilla and chamomile. Diffusing these essential oils with a humidifier helps me to relax. I also use a humidifier to avoid dryness in the bedroom. In times when the weather is dry, diffusing some water with mu humidifier enhances moisture in the bedroom. By doing this, I can sleep better and avoid skin dryness. Skin dryness and dry eyes can affect the quality of your sleep. Hi, Martin! Thanks for the reference in your infographic as well as your nice comment. You’re so right about your comment regarding humidifiers as well as essential oils. I have issues with difficulty sleeping myself (for different reasons, especially if the air isn’t comfortable) and these are really helpful. – They’re easier for breathing and don’t overpower a room like incense sticks etc.